The Superman comics of Martin Pasko (creator of Master Jailer), The Legion of Superheroes (reference to the planet Starhaven), Doctor Who (The DEO use the same call-signs as UNIT), The Supergirl comics of Sterling Gates (Silver Banshee as an arch-enemy for Supergirl), the Supergirl comics of Michael Green and Mike Johnson (the name of Siobhan Smythe) and the Kelley Puckett Supergirl story The Way Of The World (the name of Alphonse Luzano). Why does Non explain the Kryptonian funeral rights to Kara? Unlike Clark, she should be familiar with them. Why doesn't Alex wear a helmet into a combat situation like the other DEO agents? Why hasn't Cat just fired Kara at this point, if Kara is abandoning work for DEO business so frequently that she now requires a second assistant to make sure things get done? One wonders why none of the Fort Rozz escapees have tried to leave the National City area in the dozen or so years since escaping. One also wonders why The Master Jailer is just now getting around to trying to kill off all the escapees after a dozen years. And why he's doing it in sequential order based on their prisoner number. And the sheer odds of the escapees all being in the same area to where they could be easily hunted in sequential order. Alex's gun must have some phenomenal range and power to shoot the boards above The Master Jailer's ship in such a way as to allow sunlight to stream down and hit Kara's cell, when the distance between the cabin floor and the the ship was such that they need grappling ropes to climb down to the ship. James' conflict in this episode just doesn't ring true. While it makes sense that someone as basically honest as Jimmy Olsen would be uncomfortable with lying in general and lying to the woman he loves in specific, (ignoring the character's history of indulging in some pretty crazy schemes to cover up his stupidity in his romantic life) it's just plain idiotic for him to not see the justification for locking up an amoral sociopath like Maxwell Lord, who gleefully endangered innocent people as part of his vendetta against Supergirl and threatened James himself. It's even more idiotic for him to ask Kara to reveal herself to a woman with a grudge against Supergirl and connections to a man who has made it his business to try and kill Supergirl at least once. And it's especially idiotic that James is listening to Cat Grant making a moral argument about how reporting the truth saves lives when the only possible outcome of James reporting what he knows about the DEO is people dying. Todd Sherry has a marvelously understated performance as Dr. Luzano. As heavy-handed and false as the comparison between his being executed by The Master Jailer and Maxwell Lord being locked up by the DEO is, the moment between himself and Kara in their cells is well acted and he manages to sell his dialogue here. The title for this episode comes from a line of dialogue in the opening of the 1950's Adventures of Superman TV show - where Superman is described as fighting a never-ending battle for "Truth, Justice and The American Way". In the comics, Siobhan Smythe was the name of the first human to befriend Supergirl in the New 52 reality. An Irish immigrant who had a unique power that enabled her to understand any spoken language, she instantly learned the Kryptonian language upon hearing Kara speak and diffused a tense situation between Kara and the NYPD. The two became fast friends, with Siobhan teaching Kara about Earth culture and Kara protecting her new friend from her father - a supervillain called The Black Banshee, from whom Siobhan had inherited amazing powers. Dubbing herself the Silver Banshee, she was told the family legacy would eventually turn her to evil but she attempted to resist the dark lure of her powers with Kara's help. In the classic DC Comics Universe, The Silver Banshee was the code-name of a villain named Siobhan McDougal. The scion of an ancient Gaelic clan, Siobhan attempted a magical ritual to claim her rightful place as head of the clan over the objections of her uncle and brother. She was drawn into the netherworld, where a being known as The Crone offered to send Siobhan back to Earth in exchange for a magical book that had been part of Siobhan's father's library. The quest to recover the book resulted in several murders, which got the attention of Superman and brought him into conflict with The Silver Banshee. The Silver Banshee's powers include super-strength, speed-agility, super-speed, super-hearing, super-durability to both physical and energy attacks. She has a hyper-sonic scream capable of incapacitating even Kryptonians and Amazons. She also has the ability to kill anyone by speaking their full true-name. Since her powers are magical in nature, they are capable of hurting Superman and Supergirl. The DCTVU version of Siobhan Smythe thus far has not shown any signs of any superpowers, save perhaps some kind of super-hearing that allows her to eavesdrop on people in the CatCo offices more easily. She has aspirations of becoming the next Cat Grant. In the comics, The Master Jailer was a man named Carl Draper. A classmate of Clark Kent and Lana Lang in Smallville, Draper was infatuated with Lana and hated Superboy, who continually (though unintentionally) showed-up his efforts to impress Lana. A key example of this came when their class was trapped in a cave while on a field trip. Although Carl showed impressive bravery by exploring the cave to find another way out, he was given no credit as Superboy rescued the rest of the class before Carl could report his findings. As an adult, Draper became a security expert and built the perfect prison for containing super-villains. His invention received little attention, however, until Superman heard of his work and made it even more secure... by putting it into orbit. This proved the final straw and Draper created the identity of the Master Jailer to prove his superiority by crafting a trap-filled prison even Superman could not escape. He failed, and in a final bit of irony, was locked up in the prison he had designed. The DCTVU version of The Master Jailer was a guard at Fort Rozz. Originally from the planet Trombus, he masqueraded as a National City police detective with the last name of Draper, while hunting down and killing the Fort Rozz escapees who were disguising themselves as Earthlings. He made use of advanced alien technology, including an armored suit that made him a match for Supergirl physically. Fort Rozz Prisoner 2445 masquerades as an astronomy professor named Dr. Alphonse Luzano. In the comics, Alphonse Luzano was a nanotech expert responsible for creating the technology that turned Mitch Shelley into the hero known as The Resurrection Man. Luzano was introduced in the Supergirl story The Way Of The World, where Kara and Shelley hunted forn Dr. Luzano in the hope that his technology might create a cure for cancer that Kara could use to save a little boy she promised she would help. When pondering who could be responsible for abducting various Fort Rozz escapees, Alex asks J'onn if it might be a certain someone after J'onn says they could be dealing with "an interstellar bounty hunter". J'onn says that "if he were in town, we'd know." This is almost certainly a reference to Lobo - a DC Comics anti-hero who is an interstellar bounty hunter and not known for his sense of subtly. 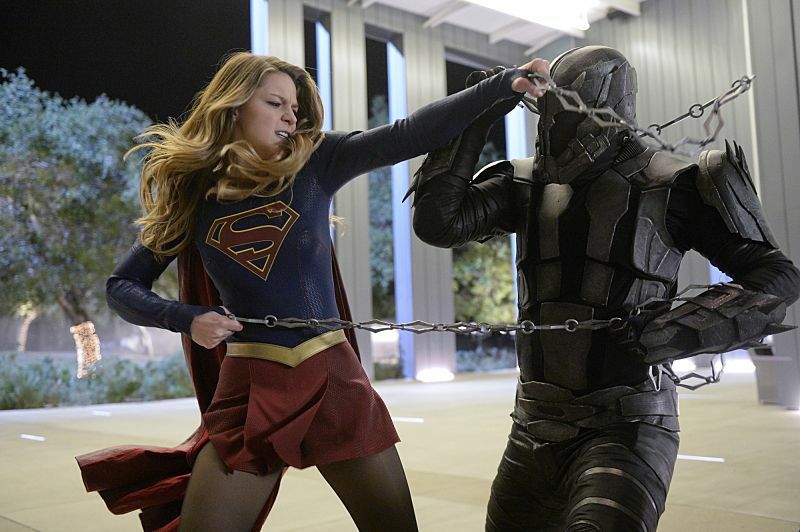 When fighting the Master Jailer, Kara says that she thought masks were only big in "that other city". This is almost certainly a reference to Gotham City - home of Batman, Batgirl, Nightwing, Robin and many other mask-wearing vigilantes. Dr. Luzano claims to have been born on the planet Starhaven. In the DC Comics universe, Starhaven is a fictional planet near the core of the Milky Way Galaxy and home to the Legion of Superheroes member Dawnstar. J'onn identifies Trombus as a planet of technologically advanced weapons manufacturers. In the DC Comics universe, Trombus is a planet comparable to Earth both technologically and socially, which is protected by a group of heroes known as The Hyper Family. The Hyper Family drew strength from Trombus' red sun, much like how Kryptonians draw strength from yellow suns. J'onn uses the call-sign Greyhound while the team Alex is leading in their search for The Master Jailer is referred to as Trap One and Alex is addressed as Trap Leader. This is a nod to the classic Doctor Who series, where UNIT - a body similar to the DEO in that it was charged with protecting the Earth from hostile aliens - made use of the codename Greyhound to refer to their command center and the various away teams were labeled Trap One, Trap Two, etc. Near the end of the episode, Dr. Luzano says he dislikes flying and is thankful that Earth's yellow sun did not give him the ability to fly. This is a mythology gag for fans of the Legion of Superheroes because at some point (the 23rd century by one account) the inhabitants of Starhaven (Dr. Luzano's homeworld) were genetically-altered so that they would have wings and be able to fly naturally. The chains used by the Master Jailer are made of black star alloy. The Master Jailer's cell for Kara utilizes a red-tinted lamp to simulate the effects of Krypton's red sun in order to neutralize Kara's powers. Kara: (reciting the Kryptonian Prayer for the Dead) You have been the sun of our lives. Our prayers will be the sun that lights your way on the journey home. We will remember you in every dawn. And await the night we join you in the sky. Rao's will be done. Max: Back to your old self, I see. Kara: I suppose I owe you a thank you. Max: You owe me more than a thank you. I assumed my heroic save would earn me early parole. Kara: So you can tell the world who I am? Put my family in danger? Try to kill me again? Max: I'm just trying to protect the planet. Kara: From what?! From me?! Max: When the gods walk the Earth, it's us tiny mortals who end up suffering. (pause) So, nothing for my largess then? Kara: I was told you asked for and received Netflix. Max: (laughs) You thought I was dangerous before, you have no idea how dangerous I get when I'm bored. Kara: I recommend "Call The Midwife". Max: (suddenly shouting) Without me, you'd be dead! Kara: Without you, the world is a better place! James: When I'm getting a lesson in ethics and morality from Cat Grant, I know we've gone off the deep end. Kara: Okay, James? I hear you and I know this is hard, but it's not about you. James: As a journalist, knowing what I know? Kara: What you know is that we've caught the most dangerous man on the planet. James: But this is bigger than one man, Kara! You're helping them run a secret Guantanamo here and it's not just for aliens anymore. You're holding humans and you are completely unaccountable! I mean, don't you see this is exactly why Max Lord hates you? Kara: So you think that Max Lord has a real reason to hate me? James: (pauses) No! I'm sorry, no... What I mean is, he's terrified by you. Because of your ability to do exactly what you are doing to him right now. I mean, you could go in there and swat him dead like a fly if you wanted to. Kara: I would never do that! James: I know that! But look, when you have more power than any human army on Earth, you have to be better than this. Kara, it's never going to come down to just a battle of strength. Or smarts. Or even wills with you. Ultimately, it's going to be a battle of values. Your values versus your enemy's. And if you're willing to abandon those values, what makes you better than Max Lord? I mean, is this the kind of hero you want to be? Kara: I'm the kind of hero who believes in doing what needs to be done to keep the world sage. James: Well, the Supergirl I know beleives in Truth and Justice. Kara, I don't recognize you like this. James: That symbol on your chest? That means something. To a lot of people. "Stronger together" you said. But this is not strength. Dr. Luzano: I was born on Starhaven. Do you know it? Kara: Yes, my father took me there when I was younger. It's beautiful. The air smelled like cinammon. Dr. Luzano: (chuckling) It did, didn't it? After a strong storm season, one of my wives fell ill. The healing expenses were too much. And so a simple man entered the complicated world of interplanetary drug smuggling. Caught on my first run. And sentenced by Alura Zor-El to 18 years in Fort Rozz. Kara; I suppose you hate my mother too? Like all the other escapees? Dr. Luzano: I did at first but over time I understood. One tragedy cannot be undone by committing another. So when I crashed on Earth, I sought only to lead a good life. I became a professor. Taught the one thing I knew better than anyone on this planet - the stars. Alex: You're free to go. Max: That's unexpected. (stepping out of the cell) Why? Kara: Because it's the right thing to do. Alex: Because she's a better person than you are. Max: I'm relieved of course, but curious. How do you know I won't expose you, The DEO and all your shenanigans to the world once I exit this place? Kara: I don't. All I can hope for is that there's still some part of you that will listen to your better angels. Max: You're still harboring hope? Even for me? You really are an alien. Alex: If you don't have better angels - and I suspect you don't - you should know that we've amassed a dossier the size of this room, documenting your crimes, ready for immediate release to law enforcement. You tell on us? We tell on you. Max: (scoffs) Mutably assured destruction. You make me nostalgic for the Cold War, Alex. Max: (pretends to shiver) Brrrrr. On Krypton, it is customary for a surviving female of the deceased's family to lead the funeral rites. Kryptonians launch their dead into space in rocket-shaped coffins. The Kryptonian mourning period is two weeks. During that time, the family suspends all toil so that they may focus their thoughts on the deceased so that they may light the way to Rao. Max Lord is DEO Prisoner 5090. Max Lord apparently dated Jennifer Lawrence. Fort Rozz Prisoner 2444 used the alias Gabriel Phillips. His species feeds on rotting flesh and he was incarcerated in Fort Rozz on charges of murder and armed theft. James refers to the family motto of The House of El - Stronger Together - which Kara told him in 102. Fort Rozz Prisoner 2445 was masquerading as a human college professor who taught astronomy named Dr Alphonse Luzano. He was born on the planet Starhaven. He was sentenced to 18 years for drug trafficking - a crime he turned to in order to get the money to save the life of his sick wife. J'onn refers to the promise he made Jeremiah Danvers to protect his daughters, which he told Alex about in 107. Kara was taken to Starhaven by her father when she was young. She says the air smells like cinnamon. James asks Kara for permission to to tell Lucy Lane that Kara is Supergirl. The Alura hologram is forbidden to talk about Myriad upon pain of shutting down. A fascinating episode intellectually for all the references and resources it draws upon in expanding the mythology of the show's unique universe. Pity the actual story is so stupid, with the characters being bent to serve the plot rather than the other way around. The Master Jailer (who I don't think is ever actually addressed by that name in this episode) is a lackluster villain and the only thing worse than Cat Grant is having Cat Grant The Younger to make Kara's work life even more miserable.